ARM (and its partners) were arguably one of the major causes of the present day smartphone revolution. While AMD and Intel focused on using Moore’s Law to drive higher and higher performing CPUs, ARM and its partners used the same physics to drive integration and lower power. The result was ultimately the ARM11 and Cortex A-series CPU cores that began the revolution and continue to power many smartphones today. 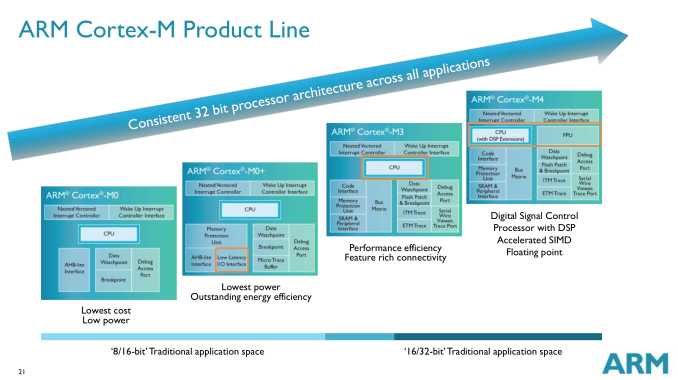 With hopes of history repeating itself, ARM is just as focused on building an even smaller, even lower power family of CPU cores under the Cortex M brand. We’ve talked about ARM’s three major families of CPU cores before: Cortex A (applications processors), Cortex R (real-time processors) and Cortex M (embedded/microcontrollers). Although Cortex A is what we mostly talk about, Cortex M is becoming increasingly important as compute is added to more types of devices. Wearables are an obvious fit for Cortex M, yet the initial launch of Android Wear devices bucked the trend and implemented Cortex A based SoCs. A big part of that is likely due to the fact that the initial market for an Android Wear device is limited, and thus a custom designed SoC is tough to justify from a financial standpoint (not to mention the hardware requirements of running Android outpace what a Cortex M can offer). Looking a bit earlier in wearable history and you’ll find a good number of Cortex M based designs including the FitBit Force and the Pebble Steel. 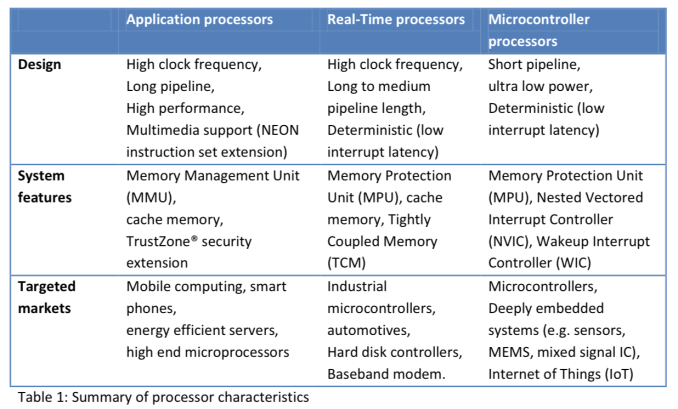 I figured it’s time to put the Cortex M’s architecture, performance and die area in perspective. We’re very much in the early days of the evolution of Cortex M. The family itself has five very small members: M0, M0+, M1, M3 and M4. For the purposes of this article we’ll be focusing on everything but Cortex M1. The M1 is quite similar to the M0 but focuses more on FPGA designs. By comparison, a 40nm Cortex A9 core would be roughly around 2.5mm^2 range or a single core. ARM originally claimed the Cortex A7 would be around 1/3 - 1/2 of the area of a Cortex A8, and the Cortex A9 is roughly equivalent to the Cortex A8 in terms of die area, putting a Cortex A7 at 0.83mm^2 - 1.25mm^2. In any case, with Cortex M we’re talking about an order of magnitude smaller CPU core sizes. The Cortex M0 in particular is small enough that SoC designers may end up sprinkling in multiple M0 cores in case they need the functionality later on. With the Cortex M0+ we’re talking about less than a hundredth of a square millimeter in die area, even the tightest budgets can afford a few of these cores. 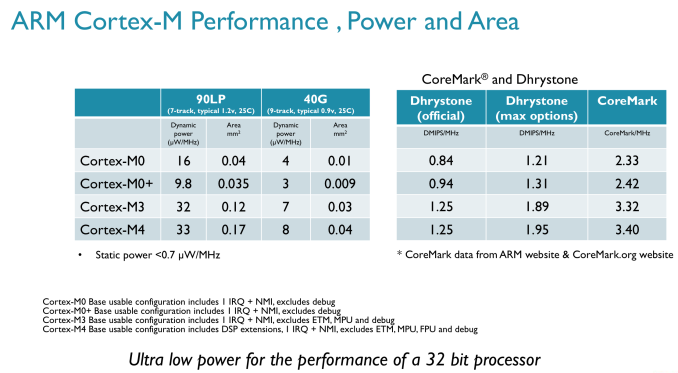 In terms of DMIPS/MHz, Cortex M parts can actually approach some pretty decent numbers. A Cortex M4 can offer similar DMIPS/MHz to an ARM11 (an admittedly poor indicator of overall performance). The real performance differences come into play when you look at shipping frequencies, as well as the type of memory interface built around the CPU. Cortex M designs tend to be largely SRAM and NAND based, with no actual DRAM. You'll note that the M3/M4 per clock performance is identical, that's because the bulk of what the M4 adds is in the form of other hardware instructions not measured by Dhrystone performance. Each Cortex M chip offers a superset of the previous model’s instructions. So a Cortex M3 should theoretically be able to execute code for a Cortex M0+ (but not necessarily vice versa). You also get support for more interrupts the higher up you go on the Cortex M ladder. The Cortex M0/M0+ designs support up to 32 interrupts, but if you move up to the M3/M4 you get up to 240. 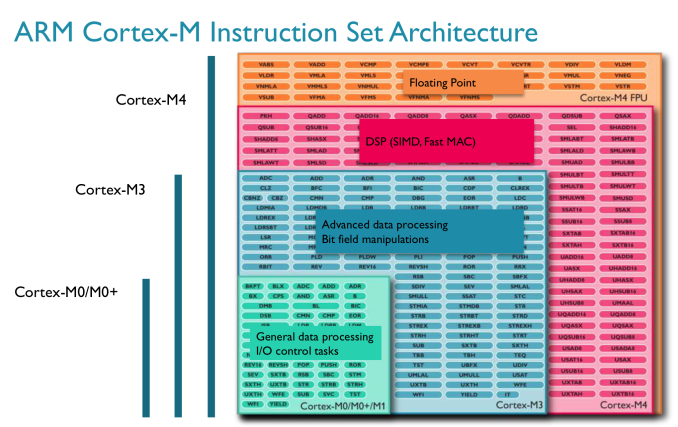 All Cortex M processors have 32-bit memory addressability and the exact same memory map across all designs. ARM’s goal with these chips is to make moving up between designs as painless as possible. 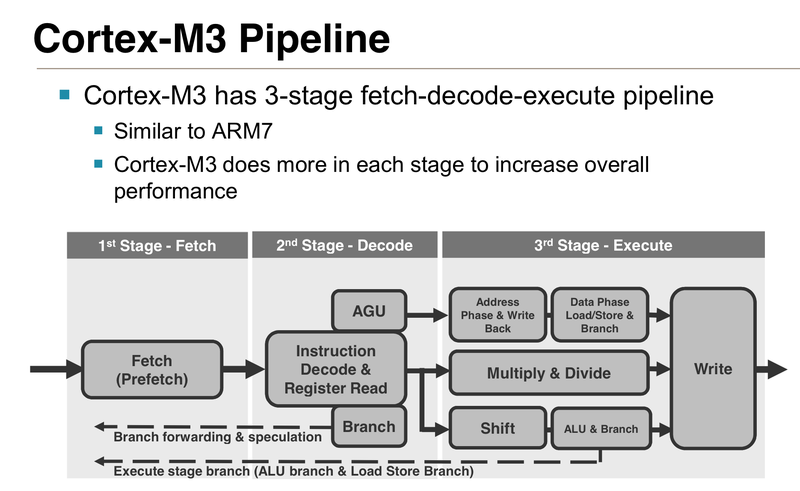 Cortex M0, M3 and M4 all feature 3-stage in-order pipelines, while the M0+ shaves off a stage of the design. In the 3-stage designs there’s an instruction fetch, instruction decode and a single instruction execute stage. In the event the decoder encounters a branch instruction, there’s a speculative instruction fetch that grabs the instruction at the branch target. This way regardless of whether or not the branch is taken, the next instruction is waiting with at most a 1 cycle delay. These aren’t superscalar designs, there’s only a 1-wide path for instruction flow down the pipeline and not many execution units to exploit. 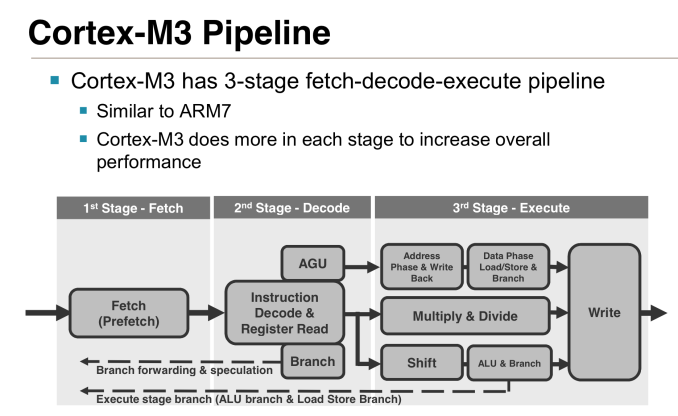 The Cortex M3 and M4 add some more sophisticated units (hardware integer divide in M3, MAC and limited SIMD in M4), but by and large these are simple cores for simple needs. The range of operating frequencies for these cores is relatively low. 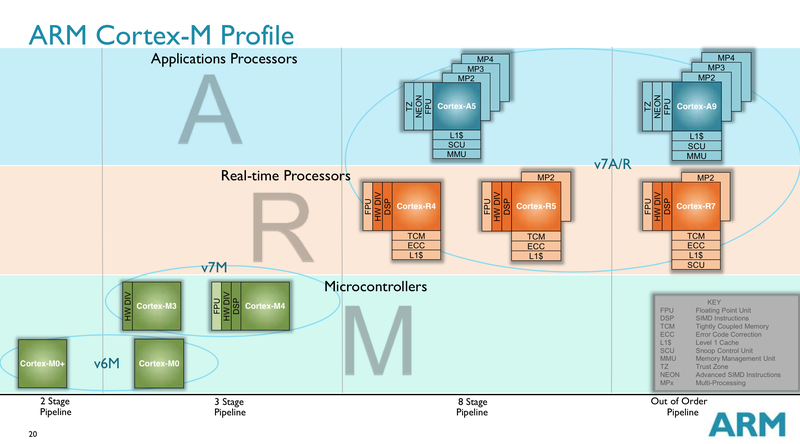 ARM typically expects to see Cortex M designs in the 20 - 150MHz range, but the cores are capable of scaling as high as 800MHz (or more) depending on process node. There’s a corresponding increase in power consumption as well, which is why we normally see lower clocked Cortex M designs. Similar to the Cortex A and R lines, the Cortex M family has a roadmap ahead of it. ARM recently announced a new CPU design center in Taiwan, where Cortex M based cores will be designed. I view the Cortex M line today quite similarly to the early days of the Cortex A family. There’s likely room for a higher performing option in between Cortex M4 and Cortex A7. If/when we get such a thing I feel like we may see the CPU building block necessary for higher performance wearable computing.